If only there was a whitepaper that could explain how digitalization is changing the retail landscape while advising retailers on how they can embrace this driving force to excel in the industry. 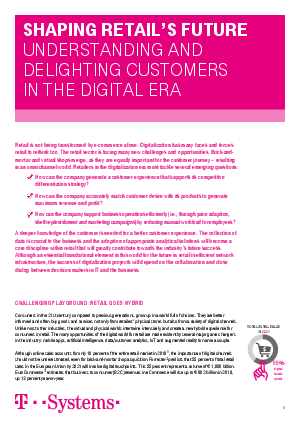 Here at T-Systems, we have produced a whitepaper that provides a detailed look into what is required for your retail business to succeed in the digital age. Our ‘Shaping Retail’s Future, Understanding & Delighting Customers in The Digital Era’ provides you with the means to safely navigate and prosper from the effect that digitization is having upon the industry. In a retail world that demands engaging with an ever more sophisticated level of consumer, those whom exhibit less brand loyalty year-on-year – the window for error has become decisively small. Our whitepaper enables your business to identify your digital needs for more effective retail operations by asking critical questions to reveal and plug your capability gaps. We examine the importance of developing the right omnichannel strategy, the need for fusing the physical store with the virtual in order to offer the seamless user experience that the modern customer expects. Further expanding on this we delve into the importance of creating and running multiple digital touchpoints to inform and guide your customers in and around the POS. In addition, our whitepaper examines the best digital tools and strategies to calibrate your use of data analytics in gaining the upper hand with your competition and establishing long-lasting relations with your target audience.